Samsung develops mini-card SSDs may drop 1.8″ HDD – Carpet Bomberz Inc.
Industry insiders in Taiwan today have claimed Samsun is dumping it’s 1.8″ Hard Drives in favor of providing devices like the Mini Card based Solid State Disk drives. 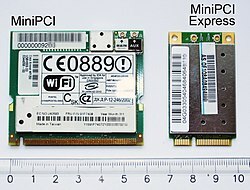 The Mini PCI Express or Mini Card form factor is available as an expansion slot on many PCs. Samsung is manufacturing Flash Drives in the Mini Card format using it’s latest Flash chips. Compared to traditional 2.5″ Flash Drives from Intel and others, Mini Card devices are going to consume a little less battery power. I wonder if any netbook sized laptops have the MiniCard expansion slots built in. It might prove to be a good marketing direction if enough manufacturers decide to add open slots to their motherboard designs. I also know that Samsung manufactuers 1.8″ Hard Drives and at one point that was the preferred form factor for netbook devices. It was also heavily used by Apple iPods. Getting rid of a SATA or PATA disk controller is a good thing. Hopefully connecting to the Bridge chips through PCIe might provide better throughput than going through a disk controller then through the same Bridge chips. The denser memory also permits a level of storage that isnt normally found in this class with 16GB, 32GB and 64GB capacities coming on launch. All of them use just 0.3W of power and so contribute little to the total power drain. Next Next post: Intel ready to launch new 34nm SSDs?